Jakarta Governor, Anies Baswedan attended closing ceremony and integrative mitigation training simulation on terorism act (K/L/D/I, Polixe and TNI) for Asian Games XVIII implementation and security.
" All Indonesian people believe and trust apparatuses for securing Asian Games"
He affirmed, Indonesian people are optimistic that Asian Games can be held successfully with support from TNI and Police. "All Indonesian people believe and trust apparatuses for securing Asian Games thus it can run well," he stated at Open Space Area of Hall D, JIExpo Kemayoran, Jl. Rajawali Selatan Raya, Central Jakarta, Wednesday (7/25). At the same location, National Agency fot Combating Terorism (BNPT) Head, Komjen Pol Suhardi Alius explained, terorism prevention action simulation in some locations needs synergy between TNI and police to have a good coordination. "TNI-Police and all the ministeries, institutions and department are cooperating to suceed Asian Gaes 2018," he explained. 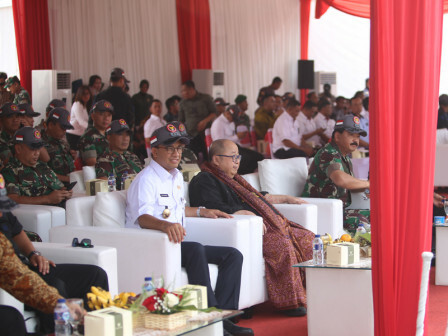 Meanwhile, TNI Commander, Marshall Hadi Tjahjanto stated, his side will provide security for VVIP especially president according to presidential Guard (Paspampres)'s standard operational peocedure (SOP). "We will fulfill the security standards based on the number of presidents who will attend in this event. We are used to do it in several events," he conveyed.